A favourite spot for children and adults alike. From the outside, this building resembles a small castle, but inside, instead of a labyrinth with mysterious stone hallways, you’ll find one made of mirrors. First you’ll make your way through the maze to the diorama of the battle of the Praguers against the Swedes at Charles Bridge in 1648 and then through the “hall of laughter” where warped and twisted mirrors will change your appearance in crazy ways. The Mirror Maze was built according to a project of architect Wiehl as a pavilion of the Czech Tourists Club at Prague Jubilee exhibition in 1891. It was built by Prague carpenter and builder Matěj Bílek. The Maze was originally located near the corner of the Industrial Palace, but was transferred to Petřín two years later. 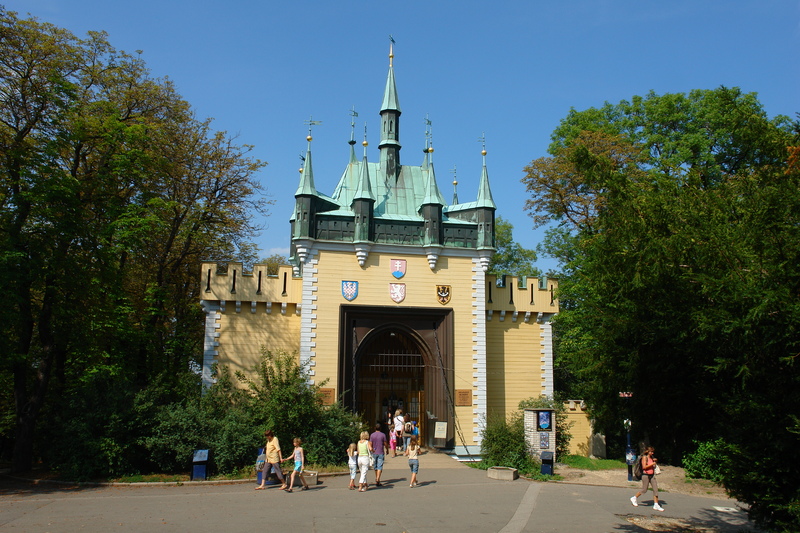 It is an imitation of the Gothic gate at Vyšehrad named Peak (Špička), built in the 14th century by Charles IV and topped by nine spires. Originally, there was a round panorama in the front rooms with twenty peepholes showing approx. 100 changing stereoscopic slides with interesting Bohemian localities. Further on, there was an exhibition of the club’s touristic and publication activities, and an exhibition of touristic products manufactured by Bohemian companies. And then there was the area with a diorama. 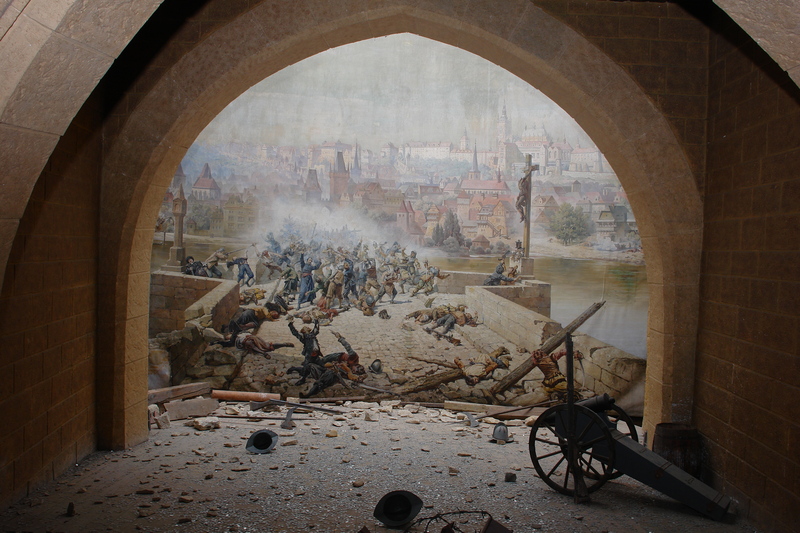 It is a huge painting with plastic front, depicting the fight of Prague citizens with Swedes on the Charles Bridge in 1648; more specifically the defence of the Old Town bridge tower by a jesuit named Plachý. The painting spreads on 80 square metres and it is a joint work of two brothers, Adolf and Karel Liebscher, who created the painting with an assistance of Vojtěch Bartoněk and Karel Štapfer. Karel created the landscape and architectural parts, while Adolf is the author of the impressive plot; they painted the whole thing in 50 days. It is interesting to see what the left bank of Vltava looked like in the mid-17th century. The pavilion was very popular, so the Czech Tourists Club even profited from its operation at the exhibition. When the pavilion was transferred to Petřín, a mirror maze was installed in the right part instead of the panorama with the slides. The maze leads towards the diorama painting. 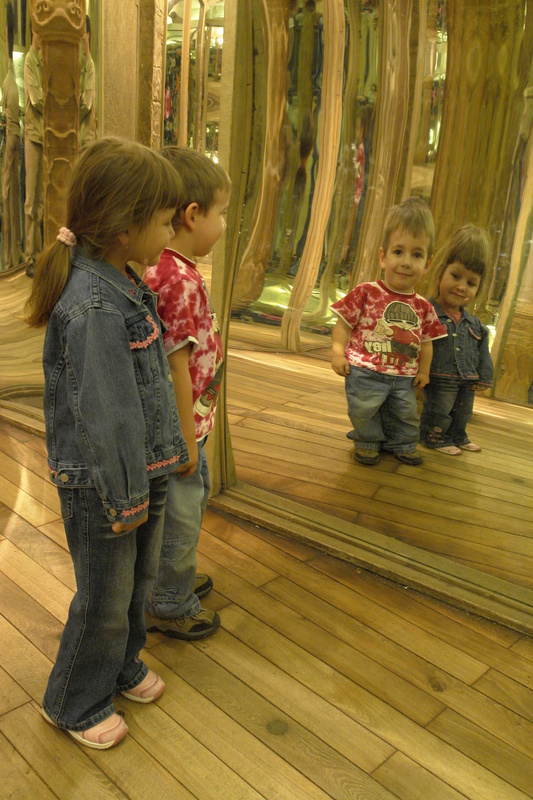 The mirror maze at Prater in Vienna probably served as an inspiration. The second room was furnished with different convex and concave mirrors in 1911 (the hall of smiles). 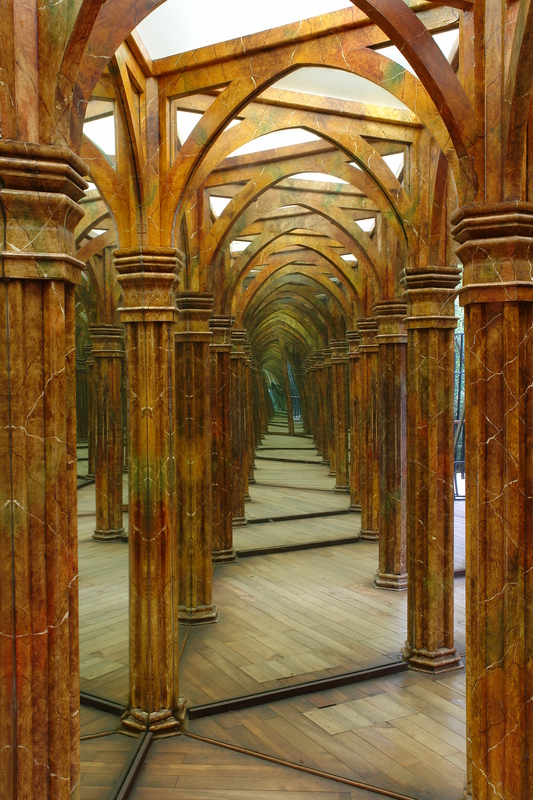 There are 31 regular and 14 distorting mirrors. On the roof of the maze, there are vanes with first names of the workers who worked at the construction in 1891; they wrote them there themselves.